Our intent is to combine old fashioned experience with new marketing techniques to provide quality auction services for marketing property. Attention Sellers! Would you like to see your auction advertised on www.goldenruleauction.com Would you prefer to list your property privately with one of our experienced sales staff and let us advertise it on the world wide web? Whatever the question, we have the answer! From Public Auctions to Private Listings, let our team get to work for you! Golden Rule - Wilson is a full service Real Estate & Auction Company. We offer years of experience in the auction industry, and we have served the entire South Central Kentucky region. Golden Rule-Wilson Wins Three Awards at the Kentucky Auctioneers Association 2016 Convention! This years awards are for Best Radio Ad and Best Newspaper Ad (Real Estate & Personal Property). Also at the convention, Chris Wilson was recognized as one of the TOP 10 Auctioneers in Kentucky for 2015. Congrats to Chris and all of Golden-Rule Wilson’s staff for their hard work. 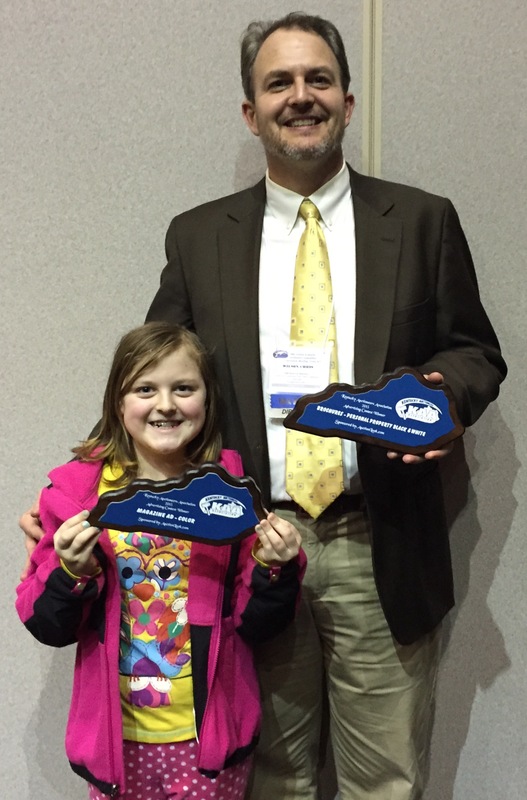 Golden Rule-Wilson Brings Home KY Auctioneer Association Awards! 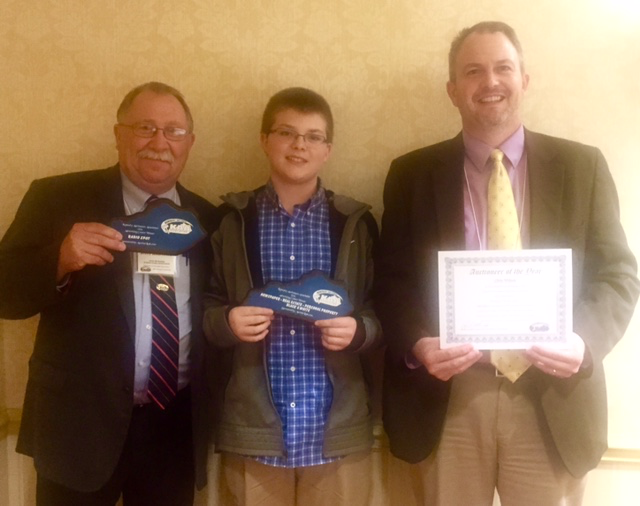 Golden Rule-Wilson WINS 2 more State Awards at the Kentucky Auctioneer’s Association’s annual meeting held in Bowling Green, KY on February 7th, 2015. These new awards bring the total of 16 awards won by Golden Rule-Wilson since 2010. That is a GREAT reason to list your property with Golden Rule-Wilson. These awards bring the total of 14 State and National Awards won by the company since 2010. Golden Rule-Wilson would like to thank everyone for their continued support and they are honored to have received these awards. These awards confirm our dedication, hard work and commitment for premier advertising and conducting first class auctions. A big Thank You goes out to all of our previous sellers and also our professional staff for helping to make this happen. We invite you to call us for a FREE consultation if an auction is in your future! The Kentucky Auctioneers Association designated Chris Wilson as Auctioneer for the Month of October, 2013 for his extraordinary leadership commitment to professional excellence and steadfast commitment to the selfless advancement of the Auction Industry. Golden Rule-Wilson wins two State Awards at the Kentucky Auctioneers Association annual convention held in Bowling Green, KY on February 10th, 2013. Both awards are in recognition for Advertising Excellence in the respective categories, Advertising- Newspaper (B & W) and Advertising-Brochure (B & W). During this convention, Chris was also elected as a three-year term Director of the KY Auctioneers Association. Chris Wilson - Golden Rule-Wilson Real Estate & Auction Win Big! The Kentucky Auctioneers Association annual convention was held over the weekend of February 11th, 2012 at the Kentucky Dam Village State Park. Golden Rule-Wilson again walked away with the top award for Best Institutional Promotion (color) Category as they did in 2011 bringing the total number of wards won since 2010 to Nine. Along with winning this award, Chris Wilson also competed in the Champion of Champions Auctioneering Championship competition which only happens every five years and is open to all previous Kentucky Auctioneering Champions. 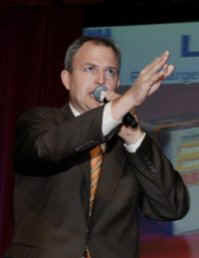 Chris Wilson competed against several other exceptional auctioneers and won Reserve Champion in this prestigious event. 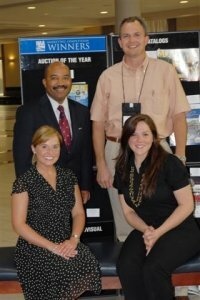 Golden Rule - Wilson Real Estate & Auction does well at the National Auctioneer’s Association in Greensboro , North Carolina - Winning the 2010 National Auctioneers Association Award of Excellence in Auction Marketing and Promotion for best Newspaper / Magazine Advertising (two color). This win stems off of the company’s earlier successes in 2010 at the Kentucky Auctioneers Association Convention held in Bowling Green , KY. 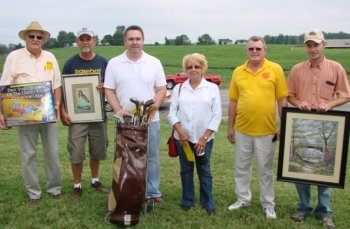 This convention hosted some of the leading auctioneers throughout Kentucky . At the state level, Golden Rule-Wilson Real Estate & Auction, won the top award for five separate categories which included: Best website (www.GoldenRuleAuction.com), Best real estate auction ad (b & w newspaper), best personal property auction brochure (b & w), and best institutional promotion (b & w). The evening was topped off when Golden Rule-Wilson’s Principal Broker & Auctioneer Chris Wilson won the 2010 Kentucky State Bid Calling Championship. 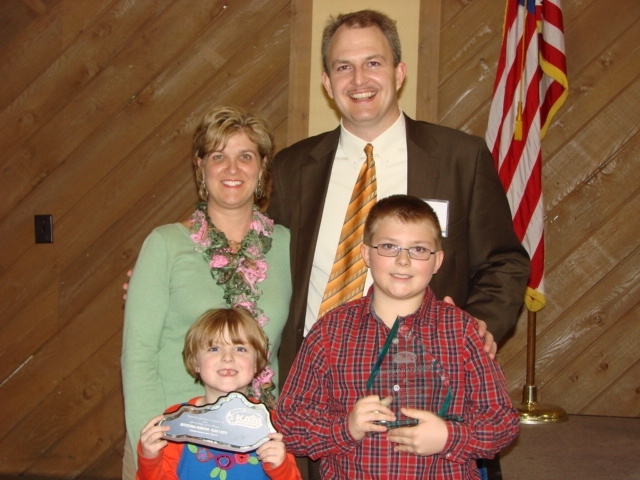 Wilson previously won the real estate auction advertisement award (b & w, newspaper) in 2009, and his late Uncle Curtis L. Wilson won the Auctioneering Championship in 1979. Auctioneering is a tradition for the Wilson Family in the Lake Cumberland & Green River Lake Region of Kentucky . Col. Curtis L. Wilson began the family auction business in 1965 and his nephew Chris Wilson continues to vigorously promote the auction method of marketing goods, as well as real estate in the area and has now begun cooperation with traditional brokerage companies that do not offer auction services; therefore, covering a broader region. 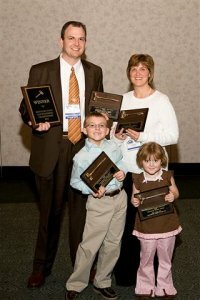 Golden Rule-Wilson maintains offices in Columbia , KY and in Russell Springs , KY.
Pictured at Left: Chris Wilson, his wife Jill, and children Simon & Gracie display their awards won at the 2010 KAA convention in Bowling Green , KY.
Chris Wilson, owner of Golden Rule Wilson Real Estate & Auction has completed courses to receive the National Auctioneers Association (NAA) Education Institute’s Certified Estate Specialist (CES) designation. 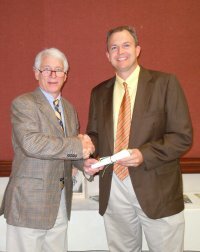 To earn this designation, he was required to complete 24 hours of coursework and pass a comprehensive written exam. The designation program is one of many offered by the National Auctioneers Association Education Institute, which prides itself on enhancing the expertise of its members by offering continuing education and specialized programs focused on all aspects of the auction business. The CES program educates auctioneers on how to best handle the settling of estates; as well as how to be a facilitator with family members and lawyers when an estate is settled. Wilson states, “My goal has always been to serve my customers’ needs fairly, efficiently and effectively. Be assured that I will remain steadfast in my efforts to keep up on the legal aspects of settling family estates so that I can continue to offer top quality services to my customers. I look forward to using my expertise to help meet your family estate needs. If you have any questions about the auction industry and how my business can best serve you, as always, feel free to call me anytime. With more than 6,000 members from throughout the world, the National Auctioneers Association is the largest organization of its kind dedicated to promoting the auction method of marketing and competitive bidding industry. The organization was founded in 1949 and is headquartered in Overland Park , Kansas . Congratulations to Chris on this outstanding accomplishment. At Left, Pictured accepting the USA Today National Advertising Award is Principal Auctioneer Chris Wilson (back right) along with newspaper staff. Golden Rule-Wilson Real Estate & Auction would like to thank everyone for their donations for the annual benefit of St. Jude Children's Research Hospital. This event was held in conjunction with one of Golden Rule-Wilson's sceduled auctions that was held for the Aaron family on July 31, 2010. Pictured are the lucky bidders that purchased items that were donated to St. Jude's. Pictured from left to right are Bruce Wilson, James Murphy, Jeff Loy, Ruth Neat, Shorty Hadley, and Waylon Wright. Golden Rule-Wilson would like to thank all participants in the auction and would also like to thank Ruby Roach & Janice Kelly for their donations of items to be auctioned as well as the Aaron family for letting this be a part of their auction. This years auction raised $454.81 that will be donated directly to St. Jude's. We would also like to thank the local media for their support for covering this event.